The bets that many bands make in playing Classic Rock (or it can called Hard Rock, or any other musical label the listener wants) results sometimes in great fails. But when they hit the target, it’s always something very good. 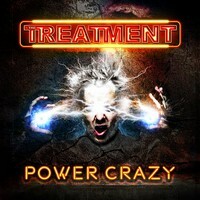 And it’s the case of “Power Crazy”, the fourth album from the UK based quintet THE TREATMENT. It’s a wild and savage Hard Rock/Rock ‘n’ Roll with clear influences from AC/DC, NAZARETH and other good bands that prefers to use a simple musical approach. But they don’t live in the past, because their music flows actual and full of energy. The melodies are nasty and excellent, and the choruses are perfect (it’ll be hard for the listener to forget them). Yes, besides their musical genre isn’t new at all, their personality is really amazing. The production of “Power Crazy” is really excellent, because the band sounds alive and fresh with such old musical way. It’s organic like the band just entered the studio and played the songs, without endless editions. But the modern clarity from digital technologies is present on how the result is something really clean. Yes, they made a right choice in every aspect of the recording, mixing, mastering and on the instrumental tunes. Honestly, “Power Crazy” is an album easy to hear and love. It becomes an addiction when songs as the nasty Hard Rock “Let’s Get Dirty” (excellent guitar riffs with easy melodies), the savage energy that comes from “Rising Power” (excellent vocals), the Blues/Country touch on “On the Money”, the thunderous and way down chariot called “Bite Back” (very good and simple tempos, showing how bass guitar and drums forms a solid unity), the accessible rhythm “Scar with Her Name”, and the wild and freaking ones “King of the City” and “Laying It Down” start to play. And on the physical copies, a bonus on the acoustic version of “Bite Back” is presented. You can have a physical or digital version of “Power Crazy”, but the readers must hear and have it at any cost!